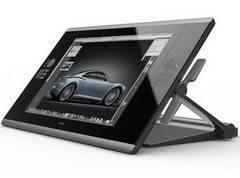 Wacom has come up with a new interactive pen display, the Cintiq 24HD. The Cintiq line is the integrated pen tablets where one can draw directly on the device. They also had a few models earlier as the 21UX and 12WX, which were also pen tablets equivalent of touch screens. Though the model is a bit heavier but the special design with the stand helps it to tilt the display to multiple angles, and also bring the screen forward over the keyboard. This model has a Display screen dimension measuring a monstrous 20.41 x 12.8inches and it provides a 1920 x 1200pixels of resolution. As this device is mainly designed from designing point of view more stress has been laid over the display. The Aspect Ratio of the screen is 16:10 with 178° viewing angle horizontally and vertically. It is ultra-sensitive with reportedly the most sophisticated pen technology and is capable of detecting 2048 levels of pen pressure and 40° of tilt. This model is designed for compatibility with any kind of OS starting from Windows XP to Windows 7 as well as Mac OX X 10.5 or greater. Some of its interfaces include USB data port, DVI-I, and Display Port. It requires a power supply input of 100-240 VAC 50-60 Hz. Wacom has provided 10 user assignable Express keys. The technology provided is patented electromagnetic resonance method. The pen provided includes 6 standard, 1 stroke and 3 felt nibs with a tilt range of 40°. The pen is pressure sensitive, cordless and battery free. The physical dimensions of the model measures 30.29 x 18.26 x 2.5inches and the model weighs around 64 pounds along with the stand. The price tagged with this model is quite high for most of the people we can guess. It is priced as $2499 with a warranty of 2years for the customers in US and Canada.